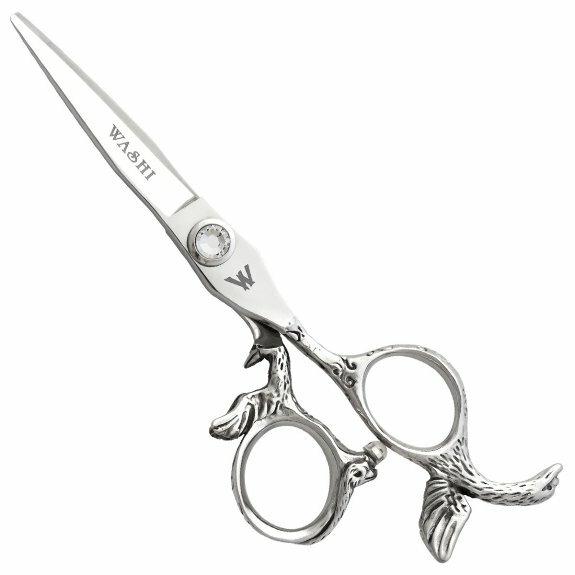 The Silver Swan shear allows you to reach the next level of your creativity. The Silver Swan shear allows you to reach the next level of your creativity. Made from Japanese 440C Steel for durability and advanced edgework. Perform precision work while relaxing your hand on this soothing tool. Scissors Getting Dull? Use Our Professional Scissor Sharpening Service. In addition to our great scissors, we offer professional mail-in scissor sharpening. We will balance, align, and provide your scissors with a razor sharp edge all performed to factory specification. All work is guaranteed so send us your scissors to be sharpened today. Lowest Price* on Washi, Guaranteed! So you found a cheaper Washi price? Tell us about it! Remember, this guarantee applies to other legitimate (non-auction) websites selling unused Washi scissors. * We reserve the rights to determine the validity of the source and/or whether to honor competitions price. Purchase over $199 in hair scissors or accessories and get free shipping anywhere in the United States! It doesn't get any easier than this. Fill out the form, agree to the data storage, and send it off. We can't wait to connect! In order to complete your request, we need to store and process your personal data. If you consent to us storing your personal data for this purpose, please tick the checkbox below. I agree to Stay Sharp Shears storage and processing of my personal data. © 2014 - 2018 Stay Sharp Shears. All Rights Reserved. Implemented by Endless Mountain Solutions.